How much pride do students at The Catholic High School of Baltimore place in their recently renovated gymnasium? 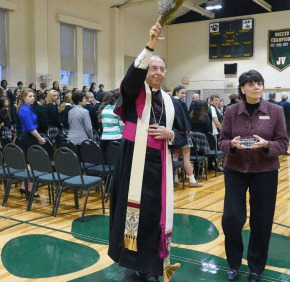 Archbishop William E. Lori experienced that spirit Jan. 27, when he joined the entire student body and staff to bless the new-look Eleanor DeCarlo Romadka Gymnasium and tour the school. It was the de facto start of Catholic Schools Week, as snow had canceled classes in the Archdiocese of Baltimore the previous day. Guests included Romadka, from the Class of 1951. Catholic High was less than a decade old when she enrolled there out of her parish school at St. Elizabeth of Hungary in Highlandtown. The gym had a boxed-in feeling, as the original design included a drop ceiling just 18 feet above the floor. For generations of Catholic High girls, bumps and serves in volleyball were problematic, as were high-arcing jump shots in basketball. Last summer, that wooden ceiling was removed, exposing steel beams and an arched ceiling. Drab brown paneling was removed from walls, where brighter paint was applied. New lighting and bleachers were installed; the original hardwood floor was refinished and painted a sharp green and gold. Basketball standards are about the only thing that isn’t new. According to Barbara D. Nazelrod, president of the school, the improvements were identified as a priority in late 2013, when Catholic High was embarking on the 75th anniversary celebration of its 1939 founding. The project cost $400,000, and was funded by assorted foundations and major donors. The work was done by Columbia-based Manekin Construction. Catholic High has 325 students this year. While its STEM (science, technology, engineering and math) curriculum attracts students such as Lindsay, a parishioner of Our Lady of the Chesapeake, Lake Shore, who has been nominated for the U.S. Naval Academy and accepted into the University of Virginia, athletics and physical education operated under trying conditions. Minus an athletic field, the Cubs will continue to play fall and spring sports at Herring Run Park and Patterson Park, but when inclement weather forces soccer, lacrosse and softball practice indoors, the new lighting alone will improve safety. Open House tours can linger at the gym, which is visited by prospective students every Saturday in winter, when it is used for four CYO girls’ basketball games. Catholic High is sponsored by the Sisters of St. Francis of Philadelphia. Before he blessed the gym, Archbishop Lori blessed a new San Damiano Cross, such as the one that St. Francis of Assisi prayed before when he was told by God to rebuild the church. The cross will be mounted next to the scoreboard on the west wall. He referenced that it was his first visit to Catholic High.